Walking or hiking is more and more popular in Europe. It is fairly easy to get information about walking possibilities in your own country – to find out where footpaths are, where you can buy maps and guidebooks, what equipment you will need to be properly prepared for the trail, and weather conditions in the area in which you plan to walk. It is much more difficult to get information about walking in foreign countries. Tourist offices abroad often know little about pedestrian tourism in their home countries, even if there are exceptions. To obtain much if not most of the information you need, you must refer directly to organizations and authorities in the country in which you want to walk. ERA believe many people would go walking in foreign countries if they know where to go and how to get the necessary information. Walking – at normal human speed – is the best way to learn to know nature and the culture in an area or a region, and people in a foreign country! The information in these pages will introduce you to the walking possibilities in foreign countries, and tell you where you can inquire to obtain detailed information so that you can plan your walk. It thus gives you information about information, so to speak. The information is for the “ordinary” walker and not primarily for those who want to walk for several weeks along a trail or for those who want to indulge in serious mountaineering. We know that the majority of walkers walk for a day, some for a couple of days or a week. Some walk from hut to hut but the majority uses a hotel or similar accommodation for day excursions. 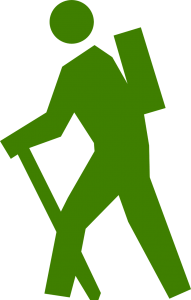 Beside the E-paths and Leading Quality Trails you may find the walking routes in Europe by asking Google, click here. Add the country or area, you want to walk, in your search.